William Ruben Thomas was born in 1866 in Gainesville. During his life Thomas was Gainesville’s mayor and a state Senator. While mayor, the city got sidewalks, paved streets and electric lights. 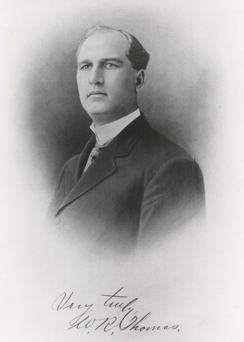 Of monumental importance, Thomas chaired the committee that secured the University of Florida for the City of Gainesville in 1905. His home narrowly escaped falling into the hands of developers in the 1970s when it had fallen into disrepair. Fortunately, it was saved and now elegantly houses many city offices and events. The Historic Thomas Center is a defining structure of Gainesville, and is a monument to the commitment of the citizens to preserve our past and history.